Hi friends! How’s the morning treating ya? Yesterday ended up being a great day. I got the girls to school on time – it’s always a bit of a rat race – took care of work stuff, and headed to a little event at the Pilot’s work. They had street tacos for dinner and they were surprisingly awesome. (I hadn’t found a taco here I love, but the search has ended. High fives all around.) P is officially a ballet drop-out (she doesn’t want to go anymore, so I’m not going to force her), and it’s been nice having that free Monday afternoon block. It starts the week off on a more relaxing note! 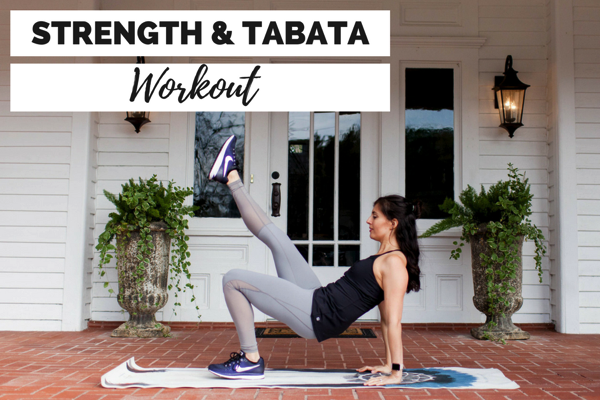 This one combines two of my workout faves: strengths and Tabata training! If you’re new to Tabata intervals, you’re in for a treat. 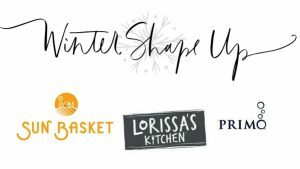 Here’s a full post with all of the details! -The intervals are supposed to be HARD. When Tabata did the original study, he wanted the participant’s heart rates to increase quickly and to a high level. 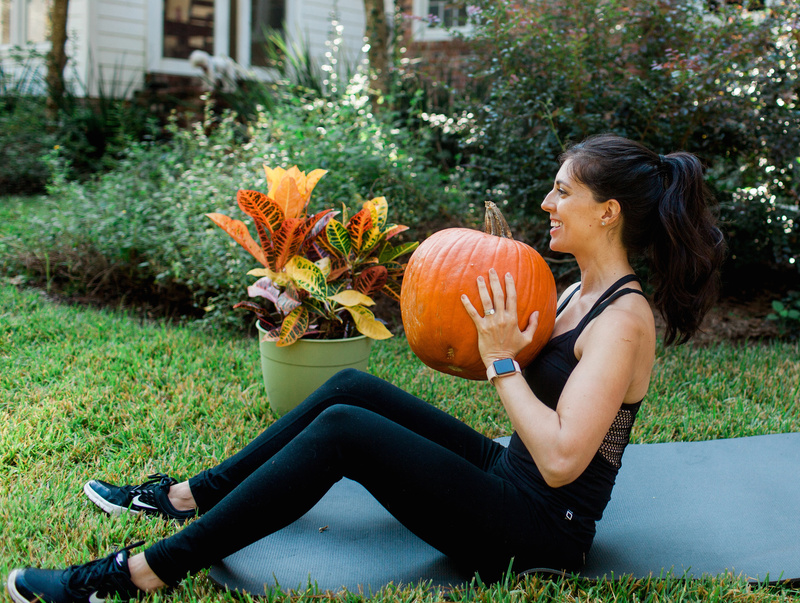 Obviously, you should scale it according to how you’re feeling and your own personal workout level, but keep in mind that it’s supposed to feel challenging. 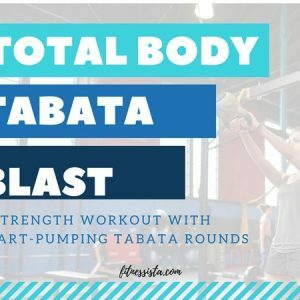 I see a lot of “Tabata” workouts floating around the Pinterest machine that are not true Tabatas. Biceps curls or weighted lunges for 20 seconds won’t get your heart rate up quickly. You want to choose challenging and often powerful movements, like sprints or plyometrics. 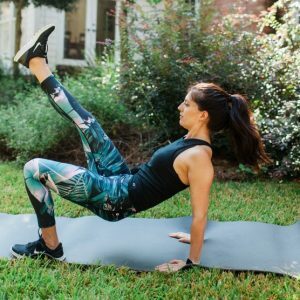 -For this workout, you’ll complete a strength circuit and then move into the Tabata interval (4 minutes). Rest for 1 minute before completing the circuit again. You can do the entire workout up to 3 times total. As always, check with a doctor before making any fitness changes and honor your body. Lunge upright row – Holding a pair of dumbbells, take a big step back to come into a lunge position. Watch your alignment and make sure your front knee is stacked over your front ankle, and your chest is lifted with a tight core. Step back to starting position, then complete an upright row, making sure your shoulders are the FIRST things to come up and the weights stop at mid-chest. That’s one rep. You can balance on one leg as you do your upright row and shoulder raise for an extra challenge. To make it more intense, lift heavier weights. If the compound exercise is too much, break it into pieces. Plie squat overhead press – Stand with a super wide stance, toes turned out, holding a pair of dumbbells. Keep your chest lifted and your weight in your heels as you sink down and endeavor to get your thighs parallel to the floor. Make sure your knees extend towards your toes, but not past them. As your rise, press the dumbbells overhead, then lower back down and repeat. Lunge curl – Holding a pair of dumbbells, take a big step back to come into a lunge position. Watch your alignment and make sure your front knee is stacked over your front ankle, and your chest is lifted with a tight core. Step back to starting position, then complete a biceps curl (squeeze your biceps and exhale as you curl). That’s one rep. To make it more intense, lift heavier weights. If the compound exercise is too much, break it into pieces. deadlift wide row – Hold a pair of dumbbells and tilt forward, bringing the weights just below the knees. Lift up from your elbows, bring them high and wide, engaging into your rear delts. Stop the elbows at shoulder height before carefully lowering back down. Exhale and rise with a flat back. Alt arnold press – Hold a pair of dumbbells at your shoulders, palms facing in. Press one dumbbell overhead as your rotate your palm out, then return to start. Repeat on the other side. 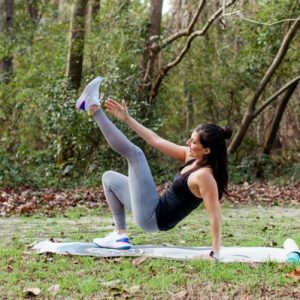 Triceps dips – Place your hands behind you on a chair or bench, fingertips facing towards you, legs straight out in front of you, hips off the ground (you could also do this with your hands on the floor). Keep your elbows in and bend them straight back, then squeeze your triceps to return to start. Keep your chest lifted and shoulders down. 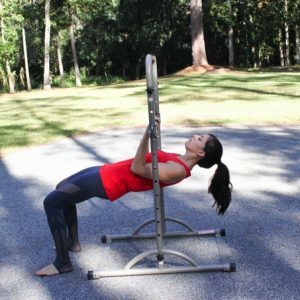 Make it more challenging by placing a weight across your hips. pushups – Start on your knees or toes, with hands wide and knuckles pressing into the floor. Keep your hips down and core engaged as you perform your pushup, exhaling on the way up. X-abs – Lie on your back with your arms and legs out in an “X” shape and off the ground. Lift one arms and the opposite leg up, reaching towards your toes, lower back down and repeat on the other side. Plank run – Come into a plank position with hands stacked under your shoulders, neck long, and spine neutral. Keep your plank position as you bend one knee towards the floor. Quickly switch sides, maintaining your plank position. -For the Tabata intervals, feel free to substitute with any of your favorite plyometric exercises, or sprints on the spin bike, rowing machine, track, or treadmill. If you’re a beginner or prefer low-impact, try 4 minutes of walking (or hill walking) instead. Have a great day and I’ll see you soon! Thanks for all the home workouts! 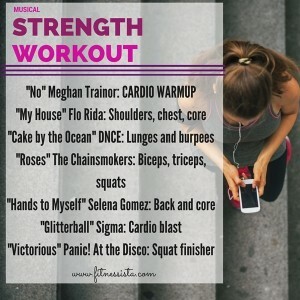 Looks like a great work out ? Love these sneaky Insta giveaways!! Saving this routine and hope to make it happen soon! Thanks for the variety in this workout! I needed something to switch it up, this looks great! Wowza! 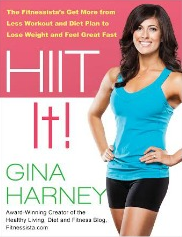 Learned so much about Tabata, it’s such a buzzy fitness term but I never really knew what it was. Thank you! Thank you for another fast and hard workout! 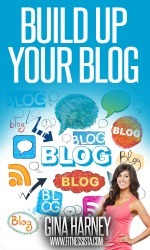 Love this giveaway. I’ve always wanted to try Beauty Counter. As often, looks rather easy but actually is a KILLER! Lesson of the day: I should incorporate more tabata in my routine (or should I….). I subbed the sprints with skaters and for the very last jump lunges my legs wouldn’t respond anymore, so they became burpees (minus the push ups to remain quick), and it felt way better!